If you’re a fan of indie gaming, the name Curve Digital should be no stranger to you. They’ve both developed and published numerous indie titles in the past and many of them have been incredibly fun to play. Their latest game, Ultratron is no different and brings with it a fast-paced, twin stick shooter that is sure to give your thumbs a healthy workout. 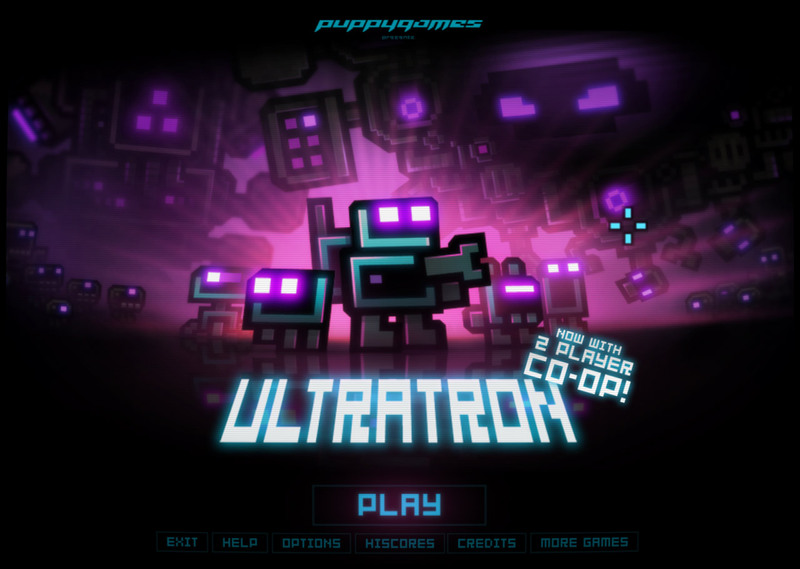 Originally developed by Puppygames, Ultratron is a modern day remake, heavily inspired by what I assume is Robotron, that features updated graphics, audio track, and gameplay elements. There’s even a rather simple story attached. 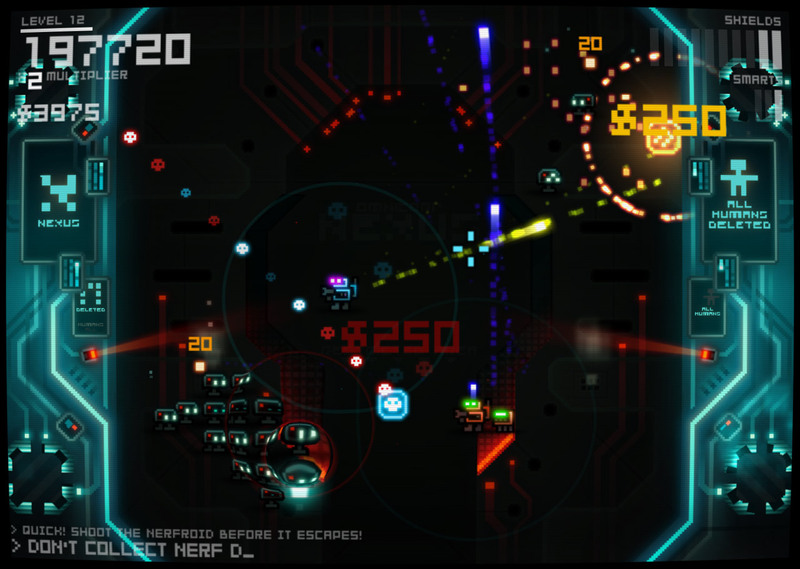 Ultratron is a twin stick shooter. That means that for the most part, you will only be using the two analog sticks on your controller. The left stick is used for moving your battle droid around while the right stick is used to aim your weapons. Left and right bumpers will come into play later when you unlock the ability to use smartbombs and speed boosts. The controls in Ultratron are quite responsive on both the PS4 and PS Vita and you should have no trouble at all moving your little droid around and aiming your weapons exactly where you want. The game is really fast faced so you’ll have to be just as quick with your thumbs. 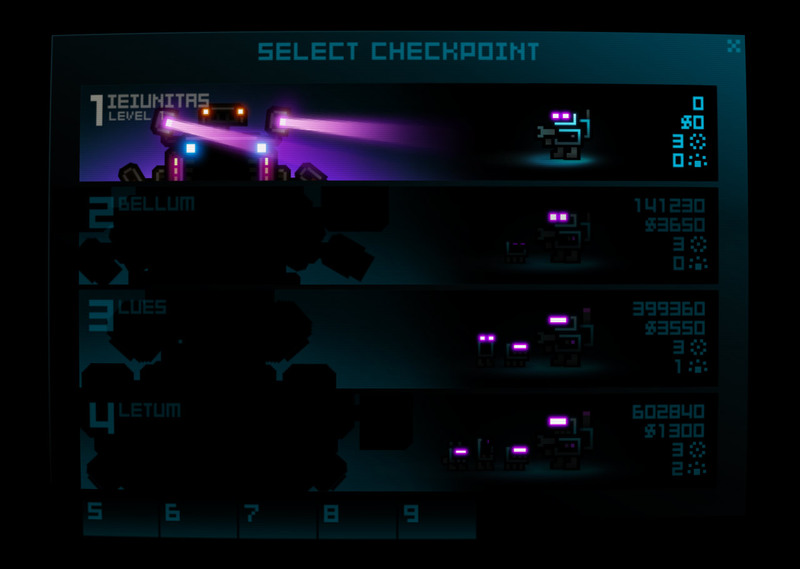 There are 40+ levels included in Ultratron, each increasing in difficulty as you progress. With a game like this though, you would expect to have to start from the beginning every time you die, but that’s not the case at all. The game has set up checkpoints after each boss battle in which you can continue off from if you were to die a few levels later. This not only preserves some of your progress, but also your power ups that you’ve unlocked. You can of course restart from the beginning if you like to get better checkpoints. Speaking of powerups, there are quite a few you can unlock, though they will need to be purchased to use them. You can buy shield upgrade, smartbombs, droid upgrades, robot pets, and robot pet upgrades. All of this is meant to increase the ability of your main droid allowing you to survive the higher waves of enemies. The only downside is that you will need a lot of money to buy these upgrades and if you’re not very good, you’ll be mainly using your money to replenish your shields and nothing else. While Ultratron is retro based, the graphics have been ramped up too look more modern. There are a lot of glowing, neon elements involved as well as a ton of particle effects and explosions. Everything seems to leave a glowing trail and it adds to the overall chaos that can occur on screen. I mention chaos because that’s what’s going on. There are literally tons of things going on at once whether it be enemies attacking you, power ups flying by, or coins you have to pick up. All of this leads to a rather chaotic game where one can get lost with all that is happening around them. With the updated graphics also comes a brand new soundtrack that is equally as intense. It’s a futuristic blend of digital noise and electronic dance that works quite well with Ultratron’s hectic gameplay. While music can be a hindrance and annoyance in some games, it isn’t in this one. An arena based, twin stick shooter from the makers of Titan Attacks and Revenge of the Titans! 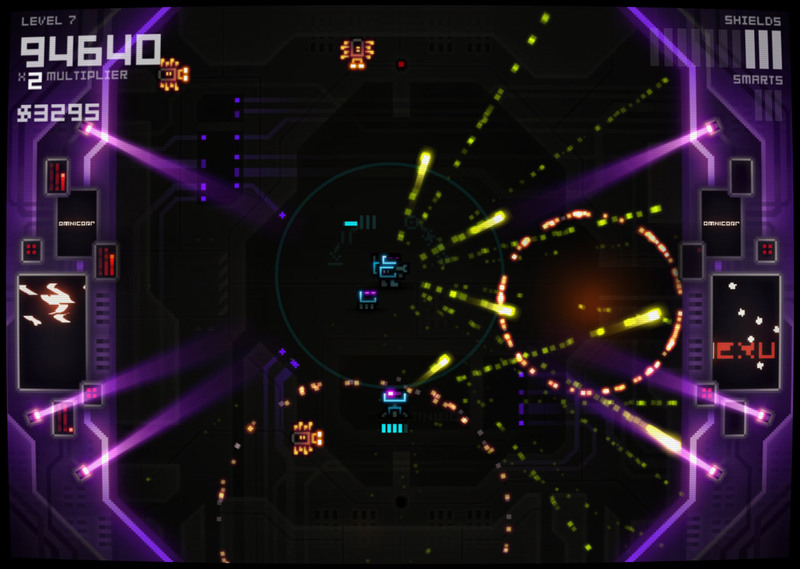 Blast your way through 40+ glowing neon levels, avoiding Chasers, Turrets, Spawners, Minelayers, bombs, and bullets. 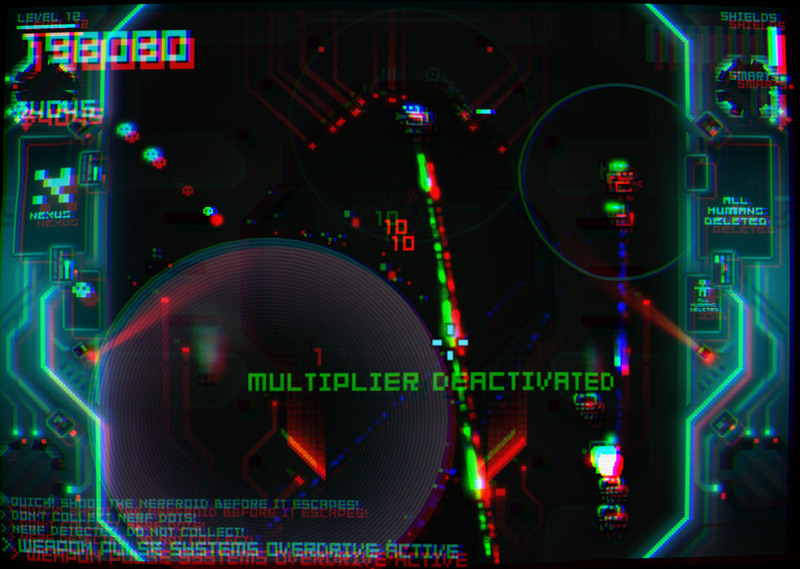 Share cash, upgrades, shields and drones in a full local co-op mode. Adaptive difficulty makes the game harder for better players, allowing you access to tense arcade moments as quickly as possible without having to replay earlier levels. You’ll notice above that it does say Ultratron has full local co-op, which it does if you play it on the PS4. If you have a spare controller, a friend or family member can join in. Co-op isn’t available on the PS Vita version so if you’re playing it on there, you’ll be doing it solo. What you can do though is share saves between the PS4, PS3, and PS Vita thanks to the cross-save feature and keep your progress between platforms. 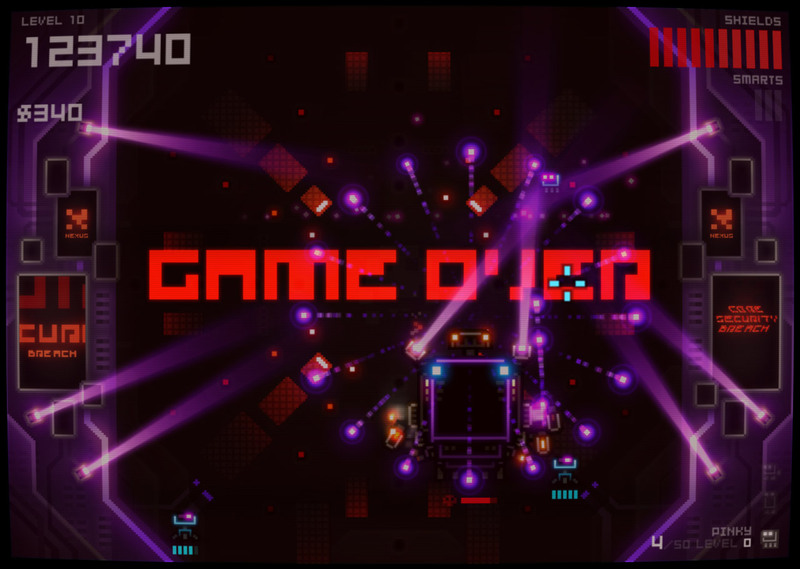 Ultratron is a very challenging game that only gets harder the further you go. This is not a game for the weak, not only mentally, but physically because your thumbs will hurt. It’s not bad at all if you play on the PS4 since the sticks on those are more comfortable but on the PS Vita, you’ll be in pain after a good session. It still plays quite well on the PS Vita, but the smaller screen in comparison to a TV will put a bit more strain on your eyes and can be difficult sometimes to tell what is going on due to the reduced size. Other than that, Ultratron is really fun regardless of what platform you end up playing it on. It makes for a great co-op game when you play at home but also makes for a really good portable game when you’re out. I really like how fast paced the gameplay is and the fact that it’s not one of those games where you have to start all over from the beginning if you don’t want to. Ultratron is available now on PSN. Buy it once and get it for PS3, PS4, and PS Vita all thanks to Cross-Buy. I love to bring you guys the latest and greatest reviews whether it be apps or gadgets. However, I can’t keep doing that unless we have your continued support. If you would like to purchase any of the items mentioned on the site, please do so by clicking our links to Amazon first and then purchasing the items. This way, we get a small portion of the sale and this helps me run the website.